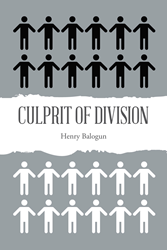 Recent release “Culprit of Division” from Page Publishing author Henry Balogun is about the author’s teachings that hate and division will not come to an end in the world without the tireless effort of those willing to be coworkers with God. Harry Balogun, an African born in Ikere, Ekiti State in Nigeria, and now a naturalized citizen of the United States, professor, and devoted husband and father, has completed his new book “Culprit of Division”: a fact-based explanation of how to bring world peace despite the ugliness of the past. According to Balogun, this little powerful book is packed with what historians refused to discuss. It traces the forgotten journey of an entire ethnic group and their contributions to civilization, development and growth. Here you will discover what is true about the twisted history of slavery, exploration swept and buried in the interest of kings and kingdom’s effort to claim what was first discovered by others many years earlier. This little book, (Culprit of Division) which according to the author represent volume one takes us to the beginning of exploration; thereby allow us to see how we got to where we are today. Historians and students of history are going to be awestricken to see the correction of history that are historically false. This book is written to agitate rather than validate. History will never be the same again. Get your copy and let the conversation begin! Published by New York City-based Page Publishing, Henry Balogun’s inspirational work focuses on attacking social evil in the interest of dismantling the platform of hate and division and is not for the faint of heart. As difficult as it may seem, the goal of this book is to achieve that greater good through the presentation of facts to discredit the ugliness of the past, thereby paving the way for peaceful coexistence. Balogun explores how the world was formed and the history of slavery to explain the rise of division between different ethnicities. However, he provides hope for the future through understanding and learning from the past. Readers who wish to experience this gripping work can purchase “Culprit of Division” at bookstores everywhere, or online at the Apple iTunes store, Amazon, Kobo, Google Play or Barnes and Noble.